Nails of my holidays: Gelish "Oocha Coocha.."
I've already worn this but as a pedicure with grand results, so for my week hiking, camping and generally just chilling out with The Man on the west coast, I decided to put it on as a matching mani and pedi :) This is an intensely sparkly teal glitter gel polish. I have a brief quide to gel polishes here.  If you haven't tried gel polish, you should get yourself a gel polish manicure for your holiday or a special occasion - nothing beats the perfect lasting power!! Please excuse the dry looking cuticles, I haven't been keeping up the hand cream lately as I've been flitting between jobs at work and at home. Cleaning and gardening doesn't help either... But I have now put my hands in almond oil and stuck on a pair of cotton gloves for the night, so I hope I wake up to hydrated mitts! This is 1 coat and a slick of MegaShine, and I am ok with the rather stringy formula due to the high opacity :) But it can be messy if you're not careful. I might go back for a few more of the colours if they still have some left! So I've been rather busy wedding planning lately, and I just wanted to show you where I am getting my bridal bouquet from - Jamball Creations. I will be able to fully customise my bouquet according to my dress, so I am really excited :) I am not a fan of cut flowers as they are so wasteful, so this is ideal for me (originally I wasn't having a bouquet at all). My Other Half will have a matching boutonniere as well :) I will definitely be showing you the photos when it's finished! 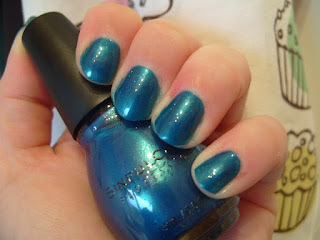 NOTD: Sinful Color "All Mighty"
I was in Poundland looking for cheap thrills and saw this beauty! For £1 you can't go wrong so I picked up this and a Revlon polish. I had a horrible feeling it would be super-sheer and disappointing but not so! This is 3 thin coats but you could get away with 2 thicker coats! :) It has a gorgeous shimmer to it, and a slight turquoise depth. I love it! Totally worth £1! 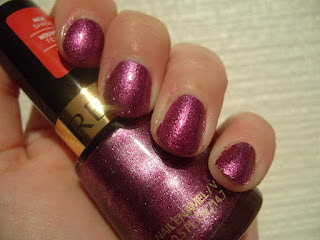 Normally we can't get Sinful Color polishes in the UK so I feel it's even better. This is worthy of it's name - this has probably become one of my favourite blues, "All Mighty" indeed! 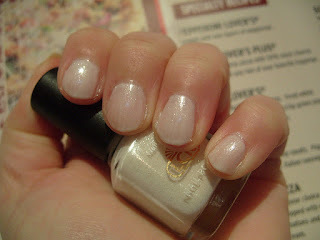 The brush on this polish was weird; short and really hard, but it was easy enough to apply anyway with some care. But I made a bit of mess on some fingers anyway ahem, I do apologise. 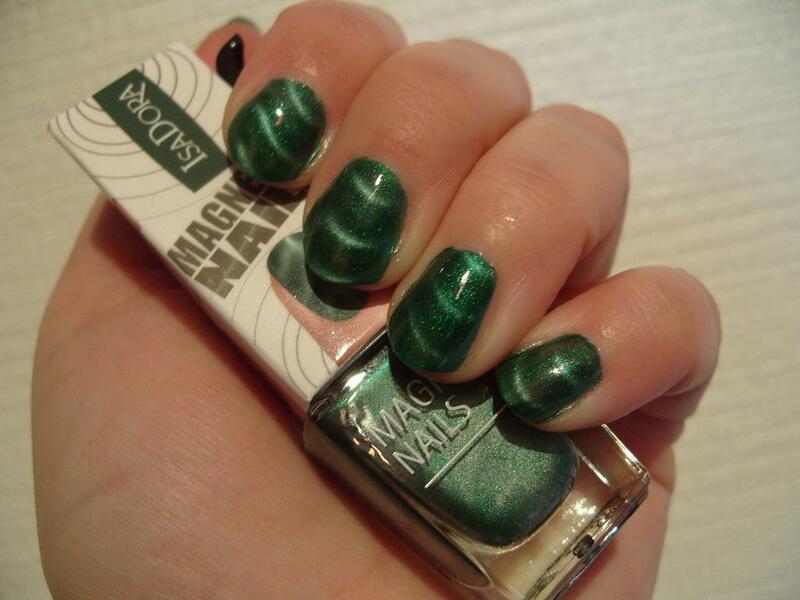 This is 3 coats with MegaShine top coat. 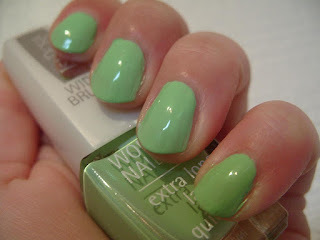 NOTD: China Glaze "Gussied-Up Green"
I found this old gem in my Helmer and needed to wear it! But I'd forgotten how weird the formula is... Thick but kinda runny and messy... But hey it's ok, that glowy green is gorgeous :) This is 2 coats with MegaShine top coat. Look what happened to my cuticle AGAIN!! It was again a tiny little cuticle bit and got caught on my apron as I made dinner and peeled off :( Very sore and unattractive, I do apologise...You can just see it oozing clear liquid now so I guess it'll be bruised like the other side tomorrow. 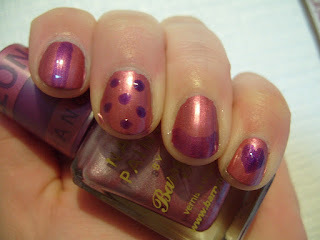 NOTD: Barry M "Chameleon Pink"
Barry M has brought out 3 new colour-changing polishes! This is the pink one, there is also a lilac and a blue version. 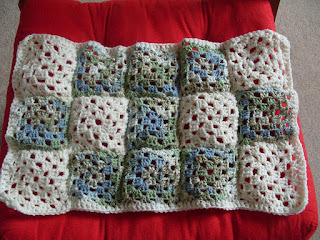 The formula is thick and very opaque, but surprisingly non-brushstrokey. 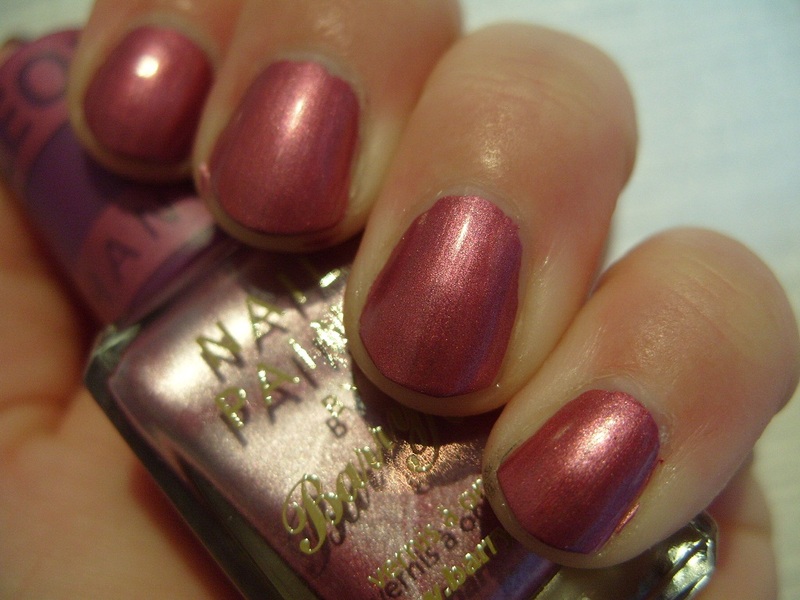 This is just 1 coat of "Chameleon Pink". I added MegaShine dots and lines. 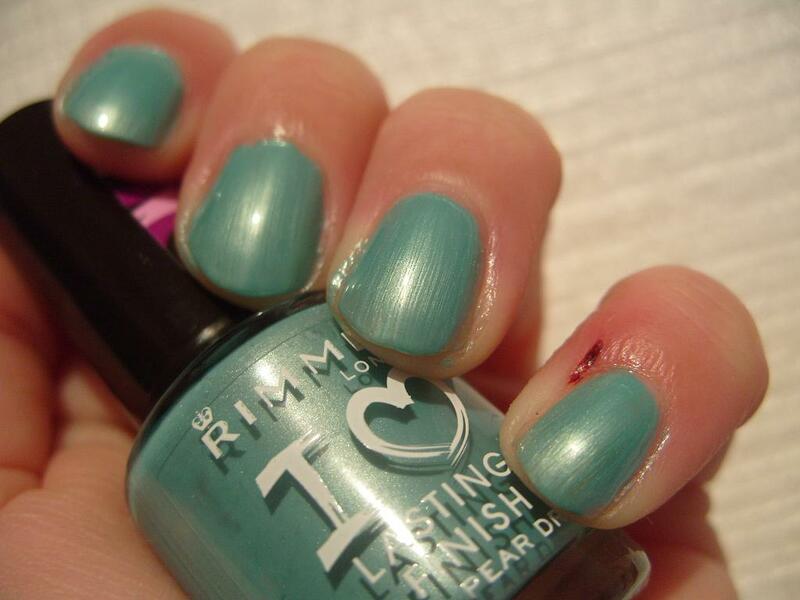 The colour-change goes darker the thicker the top coat goes on. I did a whole nail on the other hand, which wasn't as nice; I think I didn't put enough top coat on in the first try and did some 'dry strokes' which managed to smudge the polish underneath. 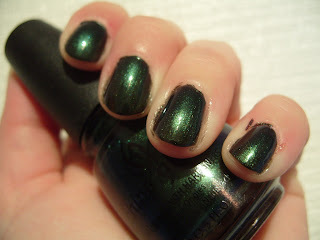 NOTD: LCN "No.331 Free Your Mind"
NOTD: Isadora Magnetic Nails "Opposites Attract"